Isn’t it a hassle when you go try to keep your class notes organized and bound, but your professor loves handouts? 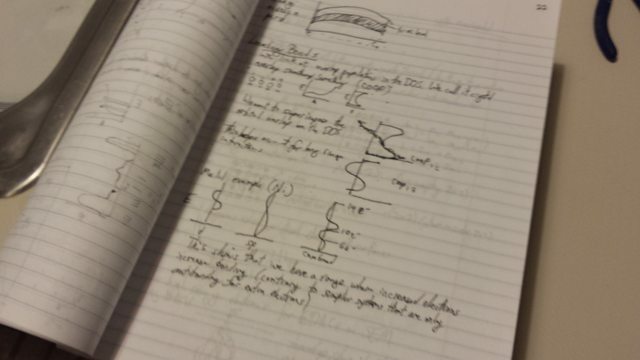 Just take to bookbinding class notes into a copy worth keeping, like I have. 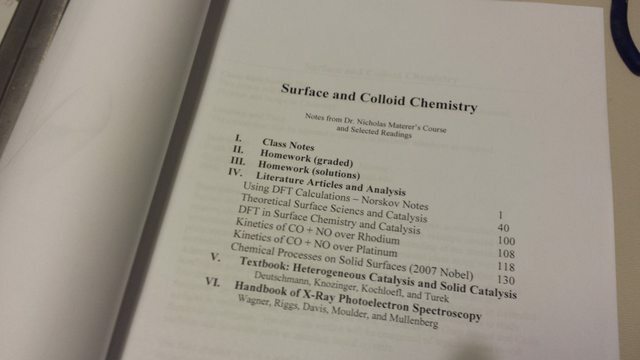 This and the post next week will show the steps I took to bind the notes from one of my classes into a hardbound copy. When preparing my notes for bookbinding, I had to deal with a combination of page sizes. I took my notes on lined paper which was slightly smaller than the handouts, which were printed on standard US Letter sized paper. This was fixed by cutting down the letter paper with a straightedge and razor. I chose to cut from the bottom edge of the letter paper rather than the top to resize. Either works, and it is a matter of preference. Be sure not to cut off something important! Once you have all of your notes ready to go, place the copies in a stack and secure with clamps. For this book, I used a piece of wood on either side of the stacked papers to prevent the C-clamps I was using from damaging the notes. The wood was positioned to leave a margin on the binding side of the documents. Next, line was traced on the top page 1 cm from the edge. This line was marked at regular intervals (I think I used 1 cm for my intervals on this copy). At each of these intervals, I drilled a small hole all the way through the papers. I used a 3/32″ diameter drill bit. It is important to note that while drilling these holes, the papers will tend to splay out. I mitigated this issue by securing the area adjacent to the drill hole with channel lock pliers. When all of the holes are drilled, use a needle and thread to bind the book. There are several different binding techniques you can use, but I have found that a simple looping forward and backward along the spine of the book was sufficient. 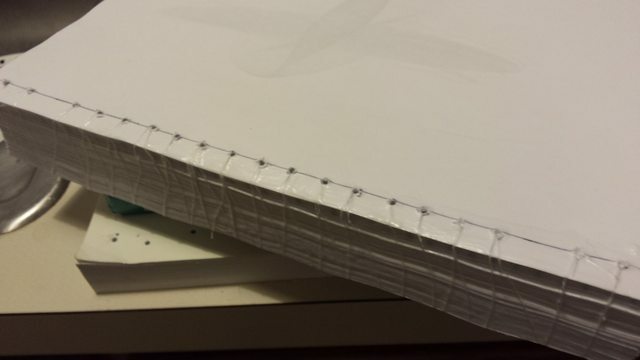 With the string tied off, I used a liberal amount of PVA glue along the spine to further hold the pages together. Next week I will describe how I make my covers.